fig.01 Quantity of reachable amenities available to a particular location in an urban network, on foot. What role does architecture play in the activation of urban space? Why are some spaces more active than others? City Form Lab’s 2 research leader, Assistant Professor Andres Sevtsuk, 3 is looking at new ways to respond to those very questions. He understands the Smithson’s “charged void” argument—a reference to the complex relationships that link the physical configuration of urban space to both the activity patterns and opinions of its users – qualities that he agrees are of great importance to any city. City Form Lab’s research examines the theory that denser city environments tend to generate higher levels of interaction between people, establishments, and institutions than sparser city environments. They argue that density increases opportunities for “both planned and chance encounters, allowing the users of an area to get more done in less time and with lower transportation costs.” However, they also recognise that density alone is not sufficient to afford desirable interactions for living, working and recreation. It is often the subtle differences in the quality, not quantity, of interactions, which make one city or neighbourhood more attractive than another. While the methods for capturing negative effects of density (e.g. congestion, friction etc.) are widely understood, the positive effects of density (e.g. 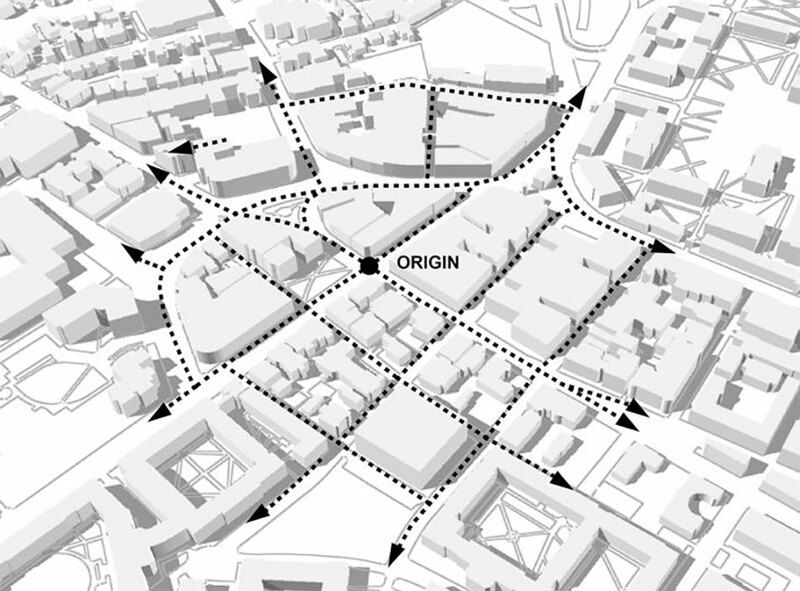 vibrancy, walkability) remain poorly explored. City Form Lab has begun to focus their research efforts on capturing the elements that contribute positively to a dense urban environment, using an analysis and mapping approach that analyses the intensity of urban environments. 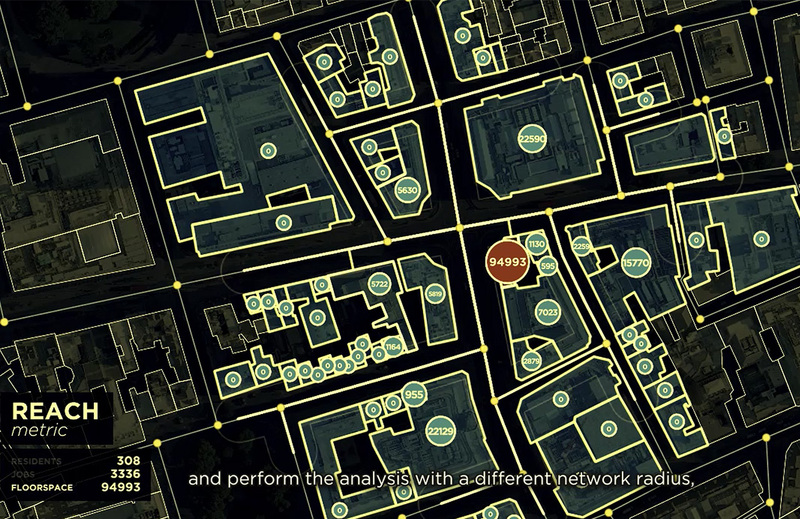 They refer to this as Urban Network Analysis or UNA. fig.02 UNA also captures quality of reachable events and amenities available on foot. Image by City Form Lab. Click to enlarge. These new tools can help us to quickly locate, not only how many destinations can be reached within a given walking radius, but also the intensity of interactions affected by spatial parameters suchs as building scale, location, shelter, setback, diversity, permeability and accessibility. When this much data is analysed over a prolonged period of time, shared patterns of predictable, and unpredictable, behaviour begin to emerge. These patterns can help us to observe the complexities of specific urban environments--where they affect urban life, and where they do not--and this kind of information will be invaluable for the planning of new buildings, public spaces and even entire precincts. 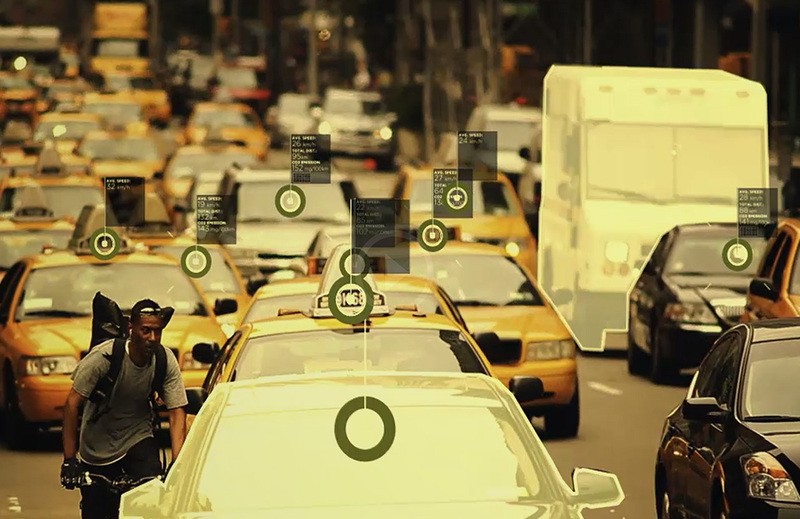 fig.03 Urban Intensity produces richer interactions between users of a city. 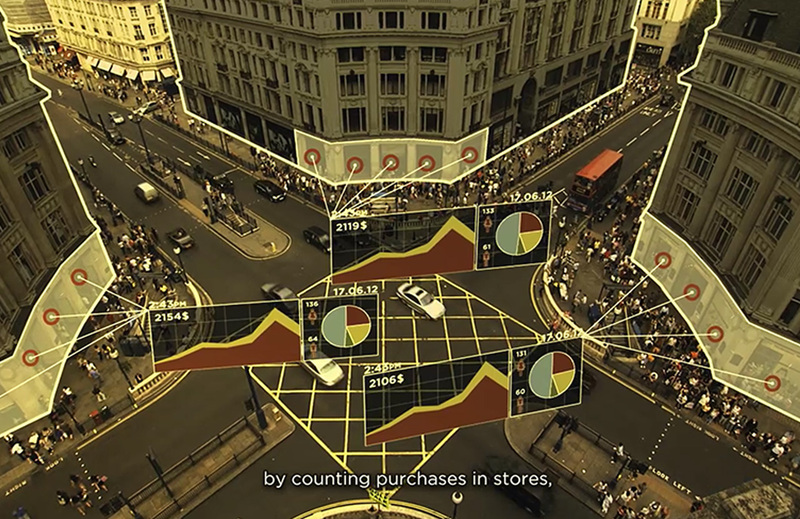 A still from the UNA video by City Form Lab. Click to enlarge. Although it is too early for the researchers to draw causal connections between built urban form and activity levels, they have shown that a high quantity of commercial activity can be achieved with remarkably different building types and neighbourhood configurations. A recent study compared two distinctly different study areas in the city of Singapore—first, the Albert Centre, a modern deep-floor-plate multi-story commercial area and, second, the Haji Lane area, a rather well preserved district of low-rise 19th century shop-houses accompanied by a few modern commercial buildings. The study found that despite the low-rise form of the Haji Lane area, it surprisingly supports a higher density of activities per floor area than its high-rise counterpart. Andres Sevtsuk explains this difference is, in part, due to the larger size of individual establishments around the Albert Centre, and in part, due to the more fine grain urban fabric, smaller shop fronts and a greater number of individual structures around haji Ln. However, per unit of floor area, the low-rise area is more commercially intense and offers more interactions with varied shops, services and their customers. When examined in the context of demographic activity in a given area, at a given time, Urban Network Analysis will become a very powerful tool in developing our understanding about how a variety of urban forms work. 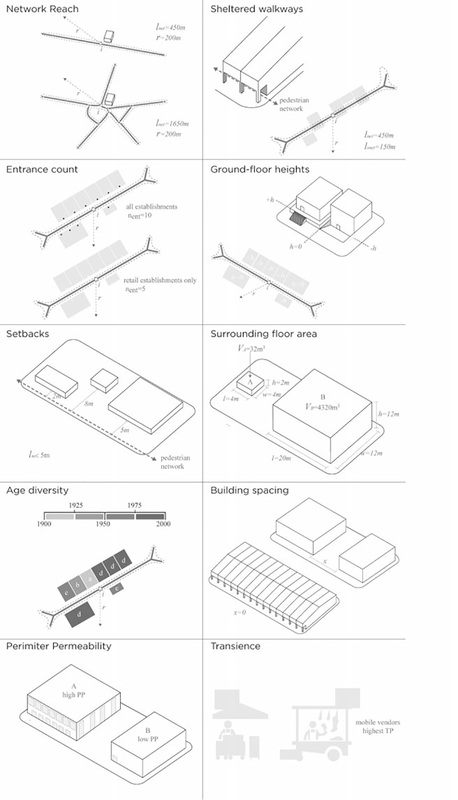 fig.04 Qualities that affect intensity and levels of urban interaction. Click to Enlarge. Scale: If the destination buildings are larger in volume, they can accommodate more establishments. Frequency: If the number of neighbouring buildings rises, that is, if there is a denser spacing between buildings per linear length of street segments, then more destinations are encountered in the same walking range. Location: If the destination is located at a more connected juncture of a street network, where more streets span out, then it can be reached by more patrons. a. Sheltered Walkways. The amount of outdoor network that is sheltered as opposed to exposed to an open sky is particularly important in hot and/or wet climates. b. Number of building entrances. Building entrances work as both origins and destinations of pedestrian traffic on city streets – streets with more entrances tend to channel more people. c. Ground-Floor Heights. Sightlines between the street and the interiors of ground floor spaces get interrupted with significant height differences (>four feet), affecting the degree to which the interior is accessible and/or attracts attention. d. Setbacks. Buildings with wider setback increase the effort for access and decrease the visibility for passers-by. e. Age Diversity. Variations in building age may contribute to the perceived intensity of urban spaces. Buildings from different eras display a body of knowledge of their time, which can stimulate associations and meanings that intensify the cognitive experience of a street. f. Edge Permeability. Permeable facades increase the visibility of the building contents, and increase the opportunities for interaction. g. Transience. This indicator captures the amount of mobile vendors that are found around a place. Vendors using pushcarts on wheels tend to be highly visible to pedestrians as they can quickly locate to areas of high pedestrian traffic. UNA tools can potentially provide more detailed information about the extent to which each of the above factors has an impact on activity, or not, within a given context. City Form Lab have recently tested the UNA tools using data collected from detailed field surveys in two comparative sites within the Bugis district in Singapore (fig.05). One, situated on the corner of the Albert Centre, the other near the northern end of Haji Lane, were chosen for their interesting differences in the surrounding urban form. The Haji Lane location illustrates a rather well preserved fabric of the 19th century shop-houses accompanied by a few modern commercial buildings. The Albert Street location used to house a similar shop-house fabric until the 1950s, but has since been entirely redeveloped with modern deep-floor-plate multi-story commercial structures. The origin pints of both sites were selected to be equidistant from the nearest Mass Rapid Transit (MRT) station – a quality whose difference could otherwise play an important role in affecting the density of commerce around the sites. The data, collected in 2012, indicates that Albert Centre area has roughly 50% more commercial destinations in a 200m buffer than the Haji Lane area, a result explained by the considerably larger and newer structures around Albert Centre, which contain three times more commercial floor area. 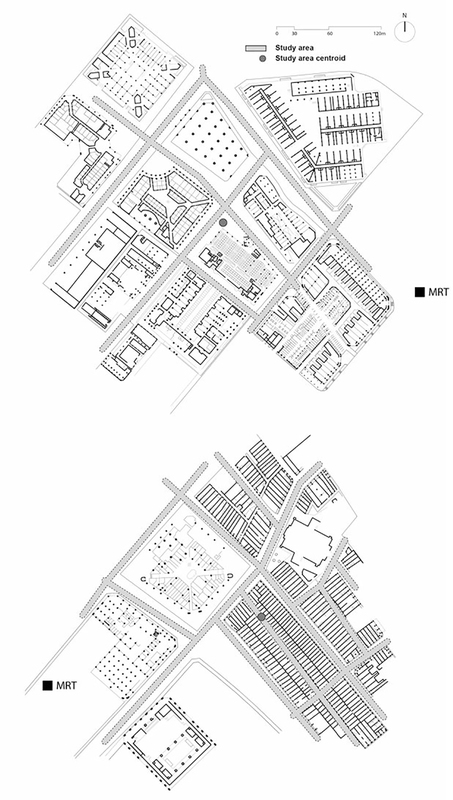 However, given the predominantly low-rise typology of the Haji Lane area, the Haji Lane area surprisingly supports a higher density of activities per floor area – 3.71 unique establishments per 1,000 square meters of surrounding floor area versus 1.68 establishments per 1,000 square meters of surrounding floor area at the Albert Centre. This difference is, in part, due to the larger size of individual establishments around the Albert Centre, and in part, due to the more fine grain urban fabric, smaller shop fronts and a greater number of individual structures around haji Ln. Per unit of floor area, Haji Lane is thus more commercially intense and offers more interactions with varied shops, services and their customers. Overall, the comparison of the sites illustrates that a high quantity of commercial activity can be achieved with remarkably different building types and neighbourhood configurations, but the nature of the built environment that results from deep-floor plate shopping malls versus small-scale and granular shophouses, differs in quality. The commercial intensity of a malls is orchestrated by a landlord, while the commercial intensity of a street frontages emerges as a result of favourable morphological conditions, location and economic interaction between multiple landlords. The latter is less vulnerable to individual whims and economic fluctuations. The research has so far explicitly focused on urban form, but not on socio-economic activities, zoning laws, incentives, or behavioural patterns that may also impact commercial intensity of the area. Furthermore, historical trends that could be responsible for the changes in the chosen sites need to be examined closely. Andres Sevtsuk is an Associate Professor in Architecture and Sustainable Design. Andres leads the City Form Lab at SUTD, which investigates the influence of urban form on the social, economic and environmental performance of cities using state of the art spatial analysis tools. He is also the founding principal of City Form Office, an architecture and planning firm currently based in Singapore.